Are you looking for a lifetime memorable short holiday? Don's miss 2 days 1 night Kathmandu & Nagarkot hiking with fun and excitement trip. Kathmandu Itinerary 2 days is specially designed for a 2 days tour or interested in nature walking or additional day in Kathmandu. Nagarkot is the one of the nearest and popular hills from Kathmandu. This Kathmandu short tour package fully entertains your additional day in Kathmandu. 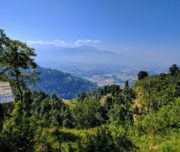 This short tour of Nepal ( Kathmandu & Nagarkot tour) offers you a complete 1 day short hiking to Nagarkot and 1 day for cultural sightseeing tour in Bhaktapur Durbar Square and Patan Durbar Square. Whether you’re short on time or have a couple days before or after your Nepal trek, here are a few great ways to explore the best of the Kathmandu Valley in two days. Kathmandu itinerary can be customized based on your interests, whether that be culture, nature, or great day activities. Great day hiking through Nagarkot. The peaceful hike, the guide’s knowledge, the beautiful landscape: All of it was superb. I’ll absolutely do this again on my next visit to the valley.